FAQ: Can you build a potable water cistern tank to my specifications? Need a cistern tank for potable water? Consider these tanks recommended to a customer looking for a similar storage unit and device. Question: I'm looking for a quote on a potable water cistern tank. I would like it to be rectangular with the following dimensions: 18'L x 8'W x 5'H. There is no existing cistern; I'll be building a box to contain the cistern to those dimensions. Answer: Thanks, yes, we can help you and design to your specifications. One of the most common options for rainwater storage of this kind is one of our Collapsible Cistern Tank for Potable Water. These tanks (also called Pillow Tanks) are flexible, economical, and can be built to almost any specification to store and collect rainwater. Pillow Tanks can be built to the specification that you have requested above, though they can also be built to several different sizes including sizing based specifically on a capacity. Standard capacities for these tanks can be built anywhere from 1 to 210,000 gallons. 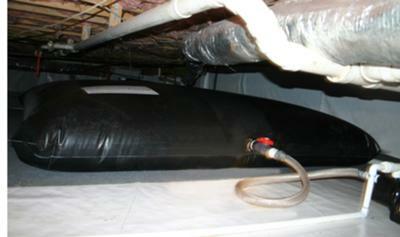 Need a cistern pillow tanks? Call GEI Works +1-772-646-0597 or fill out our quote request form. Since you have mentioned that you are specifically looking for something that can be used for drinking water, the fabrics used for your tank will be designed from an FDA or NSF 61 approved material. This will allow the unit to be approved for the safe storage of potable water. The cistern tank for potable water is easy to use. Once the tank arrives to your location, the exteriors will typically be folded up and tightly packed. In install the tank into your specified sizing unit, simply unfold the tank and place it inside the box. Once in place, tanks can be connected to appropriate hoses and other fittings to meet required storing capacities. Tanks can be connected to downspouts or other hoses depending where you are intending on storing this tank. Questions about cistern pillow tanks? Call GEI Works +1-772-646-0597 or fill out our quote request form.